Cinnabar Specialty Foods was created in the summer of 1985 in Prescott, Arizona. The first batches of Mango Chutney were made in Neera's home kitchen with her notebooks full of recipes and memories spread out before her. Before long, a commercial kitchen, office, shipping, warehouse and even a retail area were all under one big roof. It was a pleasant surprise to find out how much could be produced and handled in a small place with a small staff if we were well organized. 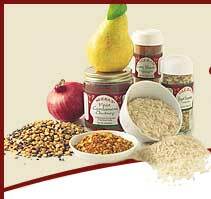 Over the years, the original selection of chutneys has grown to include an assortment of over twenty cooking sauces, grilling pastes, spice blends and rice/dal mixes. We take great pleasure in offering to the adventuresome cooking public our authentic, and often exotic international flavors. Careful blending and balancing of flavors in small, handcrafted batches offers opportunities ranging from simple and subtle enhancements all the way to center-of-the-plate triumphs! 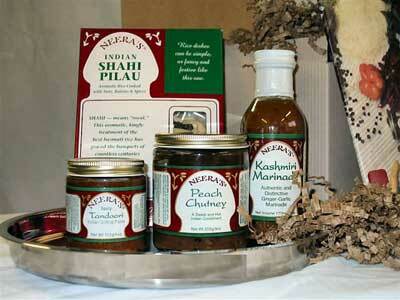 Cinnabar loves to share these products and cooking ideas with adventurous cooks everywhere. Out of the first small, folded recipe pamphlet has evolved "the sixth cooklet", a collection of company recipes and product use ideas to promote not only our products but a way of cooking and dining - full flavored and uncomplicated. 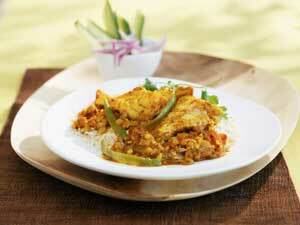 Born and educated in India, Neera has always known exotic spices. When she came to the United States in 1972, she found Western meals bland by comparison. Travel in Japan, China, the Caribbean, Australia and the Fiji Islands added to her extensive store of recipes and reinforced her love of strongly spiced foods. Ms. Tandon's goal is to share the wonderful foods of her youth and her travels with people who appreciate distinctive taste experiences. From regional adaptations, such as her Mango Chutney (Indian) or her Jerk Spice (Jamaican), to original recipes like Pear Cardamom Chutney, she excels in achieving uniquely balanced combinations. Ted has been involved in the hospitality industry for 30 years. His background is multi-dimensional. He has been a food and wine salesman, educator, caterer and consultant. He was actively involved with his family's retail gourmet wine and food shop and restaurant. 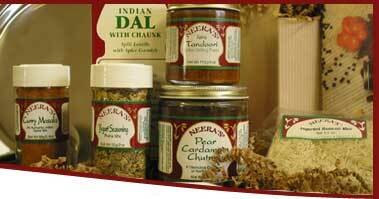 In 1985, Neera came to Ted with the idea for a better chutney, the tastes made him a believer and the Cinnabar partnership was born. 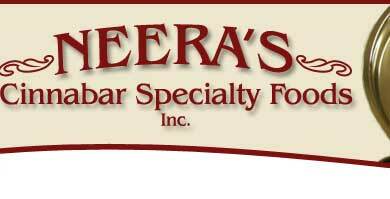 Ted's primarily Western culinary expertise and Neera's experiences with Eastern flavors, together present access to a world of authentic tastes, carefully defined for superb flavor enhancement.